Right in Our Back Yard"
A RISING CALL FOR ACTION As leader of the official opposition in the National Assembly of Quebec, Member of Parliament Louise Harel supports efforts to remove the Orphans' false labels. "The Orphans who can no longer speak for themselves, who died a tragic death or were lobotomized, deserve to have the truth told," states Carol Rutz, author of A Nation Betrayed. Montreal attorney Daniel Lighter advocates "a public inquiry once and for all. That is the only way there is to unearth the history of what happened and the role everyone played." 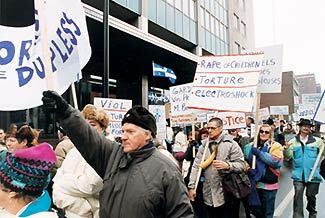 Vienneau believes many innocent boys and girls came to be used as human guinea pigs after government officials in Canada and the U.S. were co-opted by psychiatric interests. As one index of the dominant psychiatric influence, more than $50 million was spent constructing new psychiatric hospitals in Quebec between 1952 and 1962. "None of these building investments went toward enhancing the quality of service and care," Quebec Ombudsman Jacoby noted.17 Meanwhile, the children they housed suffered under barbaric conditions. Falsification of records, lies to families and horrific experiments bear similarities to Nazi psychiatric programs for ridding society of "undesirables," Vienneau said. In this case, the "unwanteds" were normal children born out of wedlock, or whose families could not afford them, or who thought their children would be better taken care of when turned over to the institutions. Vienneau is not alone in drawing parallels between the Quebec institutions and those in Nazi Germany. Concurrent with the abuses against the Orphans in the 1950s and 1960s, Montreal's McGill University was the site of Ewen Cameron's ghastly work. Cameron, infamous for barbarity and a penchant for operating without patient consent, maimed men and women with electroshock, lobotomies and drugs that included chlorpromazine and LSD. An international leading light of psychiatry, Cameron served as president of the Quebec Psychiatric Association, the Canadian Psychiatric Association, the American Psychiatric Association and the World Psychiatric Association. In a 1986 review of the experiments Cameron conducted at McGill's Allan Memorial Institute, Canadian physician George Cooper drew the same conclusion as Vienneau. Some of Cameron's victims were compensated by the U.S. Justice Department in 1988 with an out-of-court settlement totaling $750,000; in November 1992, the Canadian government announced it would give $100,000 apiece to victims of his experiments. According to one source, some Duplessis Orphans may have been "treated" at Cameron's Allan Memorial Institute, a possibility Freedom is investigating. While many would prefer not to believe stories of horrific abuse, if they are not believed, then injustice continues and similar abuses will be repeated, said author Carol Rutz. Today, surviving Orphans carry false labels of mental illness in their medical records despite decades of attempts to have them removed — a stigma that continues to haunt them. Clarina Duguay and others, for example, dread a simple trip to the doctor for any health problem. The threat of being locked up again looms over their lives — a living nightmare as long as the labels exist. "All of the Orphans who can no longer speak for themselves, who died a tragic death or were lobotomized deserve to have the truth told," said Rutz. "It takes a lot of courage to look at the truth and not turn your head away because it is too painful." Lawyer Lighter echoed Rutz by calling for justice. "There needs to be a public inquiry once and for all," he said. "That is the only way there is to unearth the history of what happened and the role everyone played." A longtime member of the Quebec Parliament, Louise Harel, is among those who have sought justice for the Orphans. On June 6, 2005, she became leader of the official opposition in Quebec's National Assembly. Harel told Freedom that the false labels should be removed and also expressed concern regarding the large number of lobotomies that had been performed in Quebec. After the interview with Freedom, and following her receipt of detailed information from Rod Vienneau, Harel wrote on the Orphans' behalf to Michelle Courschesne, Quebec's minister of Employment and Social Programs. In her letter, she mentioned the hardship endured by the Orphans and encouraged Courschesne to contact Vienneau. For Vienneau and others, the injustices suffered by innocent children stand as a powerful reminder and a mandate to keep fighting for those who perished and those who can no longer fight for themselves. "When will the Orphans truly be free?" Vienneau asked. "Hopefully, before they all die. But as long as they carry this psychiatric label of mental illness on their shoulders, they will never be free. Even today, the Orphans live in the era of Great Darkness. We want justice and we want the truth, finally, to be told."